What if I told you that you could teach spelling in only 10 minutes a day? What if I said that all the frustration and tears and the daily battle of trying to use traditional spelling lists didn’t have to be your reality, that there is a better way? 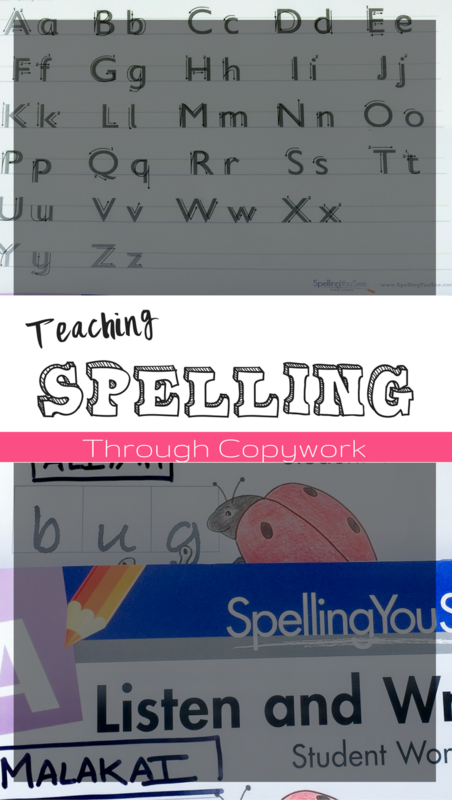 Teaching spelling through copywork really CAN be as simple as it sounds. Spelling You See is a research-based spelling program that is based on 5 different developmental stages of spelling. Teaching our children a random spelling word without context or visual cues to help them retain that memory is fruitless. Not only is it boring but it has no meaning to our kids, which means it is shuffled into the cobwebs of short-term memory: possibly remembered for the test, but forgotten shortly after. Though Spelling You See doesn’t claim to be Charlotte Mason inspired, it adopts core Charlotte Mason philosophies such as copywork and dictation (which I love). While I do many curriculum reviews on my site to help give you guys a broad overview of what is out there and how it can be used, this is a program I am actually using this year with all my kids. Take a look at how we are using it in our homeschool this year. Each level is different in what it focuses on and looks like, so I have broken up the three levels we are using this year to give you a good idea of how this whole process works. Each level is a complete 36-week program, level A has 1 student book and 1 Instructor’s Handbook while Level B and C have 2 student workbooks (part I and part II) as well as your Instructor’s Handbook and erasable coloured pencils. Level A is based on the phonetic stage and has 1 page to be completed per day and shouldn’t take longer than 10 minutes a day. It begins by building the foundation of the program: how to hold your pencil, saying the sound as you write it, etc. and quickly moves on to dictation. The Instructor’s handbook shows you which words to dictate and points of focus. 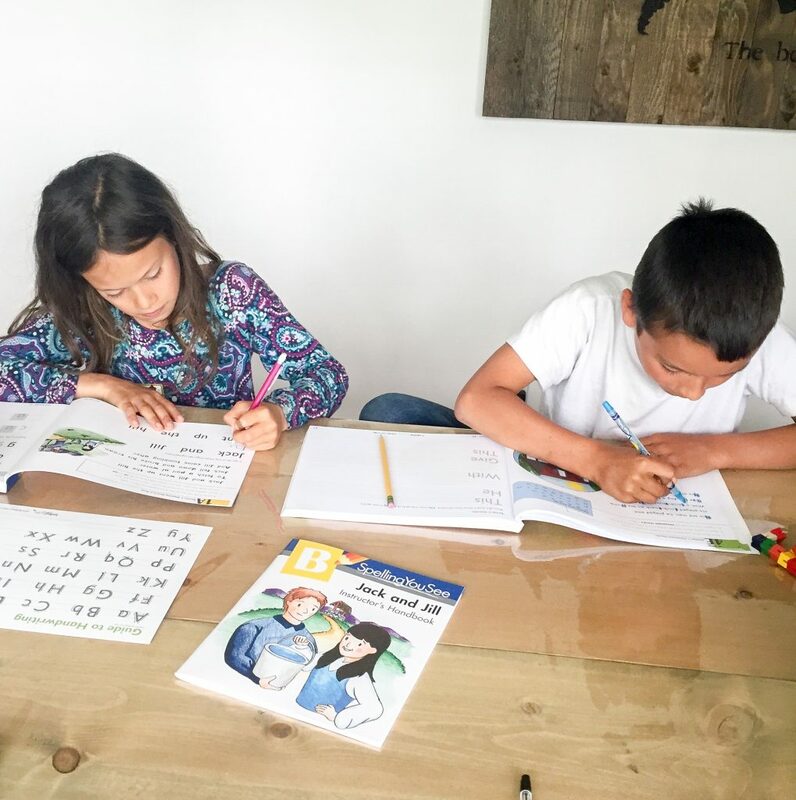 Unlike other spelling programs, the Spelling You See philosophy is based on praise, lots of help and correcting mistakes as they happen (before they become a habit) and having your child read back what they have written. The combination of hearing the words (auditory), writing the words (kinesthetic) and reading the words (visual) helps students engage all their senses and build connections with the words they are writing. The guide encourages you to anticipate where problems will occur as your child is writing and help them every step of the way. This level of parental involvement helps them build confidence in their ability and remove unrealistic expectations or pressures that they should know how to spell on their own. 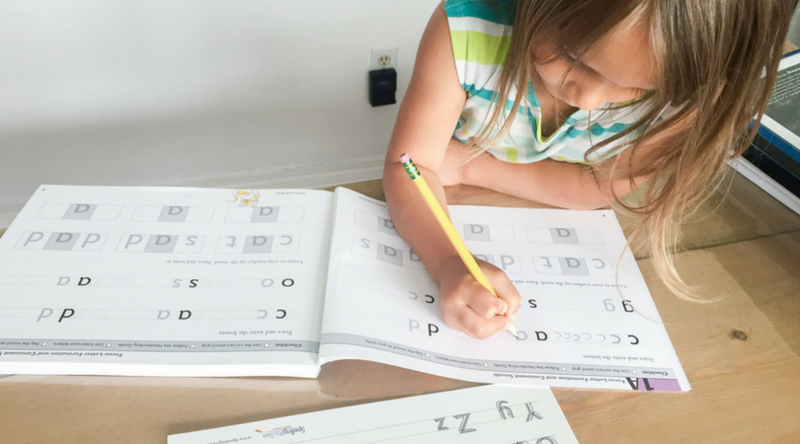 Level B is designed to take your child from the phonetic stage to the skill development stage. It uses traditional nursery rhymes to help introduce words in an engaging yet meaningful format. 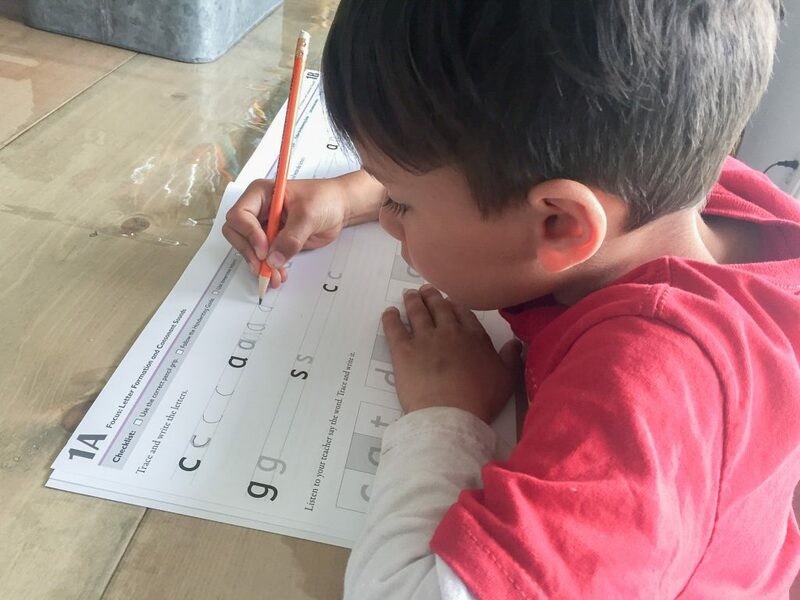 The natural poetic rhythm helps trigger memory and makes it easier for students to connect the spelling to something they are familiar with. One daily lesson is now 2 facing pages. In Part I, you read a new nursery rhyme together each week, clapping out the rhythm and syllables. Students are encouraged to find common patterns, word blends, punctuation or capitalization. Throughout the week the student copies a portion of the rhyme and works on various words that you would dictate to them to practise encoding. In Part II students begin to copy longer passages, still setting the timer and stopping after 10 minutes. The idea of them asking for help with words they can’t remember and reading their passage afterwards are still woven throughout the core of the program and help students become a bit more independent in their spelling and writing skills. Level C is focused on the skill development stage (which should go into upper elementary by the way). Students complete 2-4 pages each day (remember, not more than 10 minutes. Whatever is not completed doesn’t get done). The first 7 weeks continue with the nursery rhyme theme from level B. By week 8, students begin to read different informational passages about animals. Each day they read the passage, find various vowel chunks and mark them with their pencil crayons, and copy a portion of the passage. On the last day they write the entire story from dictation. They are encouraged to ask for help if they need it, you would set the timer and stop at 10 minutes, even if they hadn’t completed it. You would count how many words they spelled right (rather than focusing or marking how many they got wrong) and praise them for a job well done (remember you would be correcting words as they went so there would be no need to fix or mark ones that were wrong). In Part II the stories become a bit longer and you begin marking vowel chunks, consonant chunks, and bossy r chunks (where r changes the sound of the vowel). Each week includes a no rule day where students are encouraged to write their own story and draw a picture as well as a dictation day where the entire passage is dictated to them. We purchased 2 of Level A: Listen and Write for my 5 year old and nearly 8 year old to do together. I purchased 1 level B: Jack and Jill for my grade 4 daughter for this year (9 years old) and Level C: Wild Tales for my oldest son (10). My oldest was easily ready for level D or even E, but I chose to do this one because A) we had it from a previous review I had done on it and B) the content is more applicable to us. My son loves animals and non fiction information. We live in Canada and American stories are less relevant to us. Plus I ALWAYS believe that there is no harm with going back and building a strong foundation. It will help build a child’s confidence and keep them excited about that subject. Obviously most 8 year olds would be doing more like level C, but my youngest son is a very emerging reader and I wanted to start him off strong. I also find it helpful to do lessons with multiple kids at once. They both enjoy competing with one another (on a healthy level, we work on being very supportive and encouraging) and it saves me time. Even my 3 (almost 4 year old) joins in. 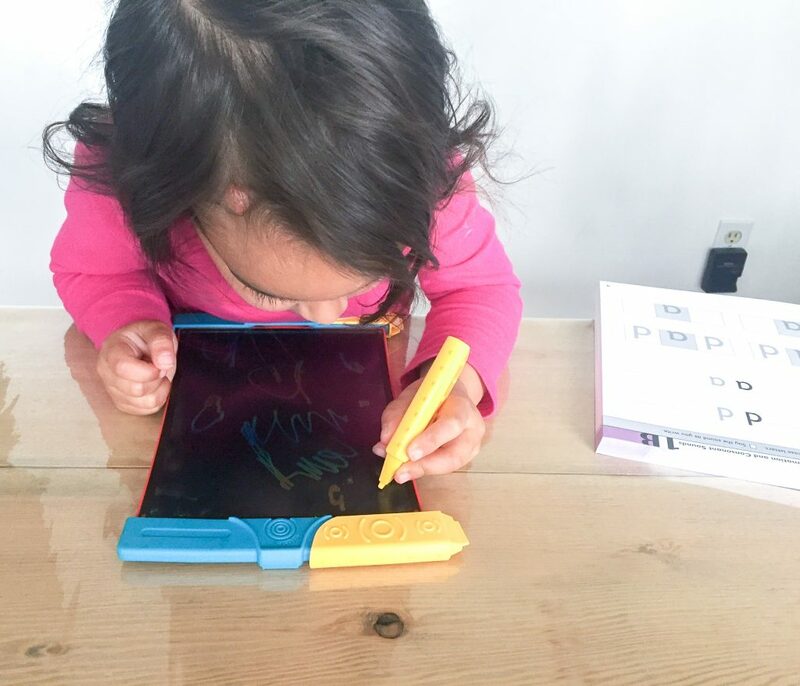 She sits on her tablet and pretends to write words and ask for help. She is still in the preliterate stage of spelling and this is the very best way for her to do “spelling” with us. There is a simple placement test you can do with your kids to see where you should start them. Although we are tempted to keep our kids in their “grade”, Spelling You See takes the pressure off of you by creating their program based off stages rather than grade levels. You can see the different passages to dictate to your child to test their starting level HERE. In the test you would either assess if your child was ready based on the questions it asks or do the dictation exercise for older levels. For dictation, you basically read the passage to your child, have them write it out and read it back to you. If they can read it and spell at least 8 of the words right, they are ready for that level. There is a lot of damage that can be done when we try to push our kids when they aren’t ready. Every child develops at their own pace and it is crucial that we approach their learning where they are at so that they don’t lose confidence in themselves or become frustrated with learning in general. I decided to include this in here for those of you who closely follow my blog and what we use in our homeschool. We are a Brave Writer family and I have read the Writer’s Jungle and implemented many different aspects of BW into our homeschool. I do not follow a curriculum, but rather bring in the BW elements through whatever we are reading or doing naturally in our homeschool. The copywork and dictation, positive, praise approach of this program align seamlessly with Brave Writer. While it might not be using classic literature that we are reading, it gives me a very simple framework to do with the kids that we do on top of our other regular copywork, poetry, reading, and writing. We are not doing this instead of Brave Writer, we are doing this alongside it. To learn more about Brave Writer and how we are using it to teach our kids writing, CLICK HERE. If you need help figuring out which level to use or what blend of books you need, the amazing team over at Spelling You See offers a free, no-obligation consultation! Check that out HERE or ask me any questions you have in the comments below! You can take the placement tests and learn more about the levels and philosphy of the program HERE or CLICK HERE to shop now! I LOVE LOVE LOVE Spelling You See. We have used A, C, D, and E so far in our family. I haven’t found anything better for spelling in my 11 years homeschooling this far. It kind of marries CM method to Spell to Write and Read in a way. I’m so excited others are dicovering the beauty of it! Hello, I was also looking at Spelling U See for our family this year. I was a little worried it could be very time consuming for me. I have 6 children schooling at home this year and also a 3 year old and 1 year old so time management if important.Do you find it hard to work with multiple children? Need help in spelling for my 6 year old child..she is very lazy…time management is important..
I’ve been using Spelling You See level C this year and I think it’s been a good fit for my child. I didn’t mean for this program to, but it has taken the place of other copy work we would normally do out of the literature we are reading. Has Spelling You See replaced other copy work for your children too, or do you have them do additional copy work from pieces of literature and other sources? While we still read a lot together and independently, I wonder if they’re missing out by not doing copy work from these quality sources of writing. What are your thoughts?